Knitting for charity can be a really satisfying way to use your skills to help all sorts of charities. If you are one of those people who can never sit down without a pair of knitting needles and a ball of wool why not turn your passion into a way to help others? 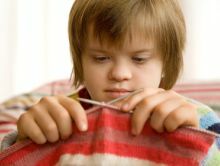 Or, if you are a total novice, a charity knitting project could be a great way to learn and discover a whole new hobby. Useful to an organisation - for instance baby blankets and clothes for premature baby wards etc. Able to be sold to raise funds. - for instance novelty tea cosies or soft toys. There are also various "super knit" projects in support of various charities. These often involve donated squares of knitting being added together to build the longest, the biggest etc etc. The purpose of these is to show solidarity with causes and help them raise awareness and sometimes funds for their projects. Your local volunteer centre will probably be able to suggest likely local groups you could knit for. There are also a number of national and international charities who will gratefully receive certain knitted products for distribution (often in developing countries). Most charities that accept knitted donations will be only to happy to let you know what they need. They often have suitable patterns too. Some may also be able to supply you with donated wool. 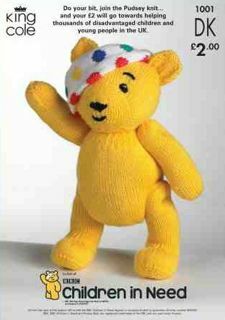 Knitters in the UK will be familiar with Pudsey Bear from the annual BBC Children in Need Appeal. You can buy a pattern for Pudsey from our friends at King Cole - all money of course to the appeal, and then the chance to earn more when you sell or raffle your Pudsey. 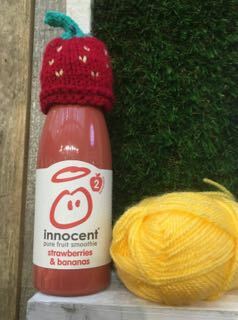 The Innocent Big Knit is a quirky idea that is perfect for the Innocent Brand. There is no more depressing site than seeing beautifully made knitted items, that someone has spent a lot of time and effort making being left unsold at the end of a charity fundraiser. Charity knitters should think very carefully about what they make and where and how it might be sold. Only you can judge what might be appropriate but it is probably best not to put all your effort into one item unless you know it is a winner. Trying to stay up to date with modern patterns, colours, trends and styles is also important. As is using suitable yarns and wool. Try to think about who might buy the items you are making. Kid's beanie hats, gloves and mittens are pretty reliable sellers. The key is to experiment and see what works. Combining your knitted items with something else can also work well. For instance a knitted Easter Bunny holding a chocolate egg etc. The trick really is to try to think outside the box and always keep on the look out for interesting knitting patterns for things you think might work. Most libraries have books of knitting patterns and ideas. 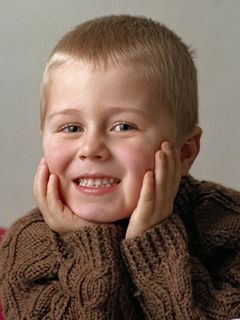 You can also find lots of great charity knitting ideas online. eBay too is a great source of new and second-hand knitting patterns. If you do have a great knitted fundraiser please share it with other people. Send it in to us with a picture and instructions and we will put it on the site. Have you heard about the latest craze taking the knitting world by storm? Groups of Guerrilla Knitters getting together to make a point with their knitting needles. Usually a bit tongue in cheek but good fun for anyone with a point to make. 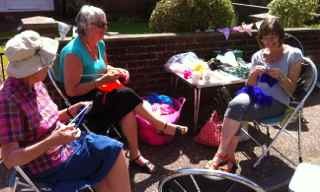 The guerrilla knitters in this group were joining in a celebration party relating to a speed reduction to 20 mph in their local community. Don't restrict your creative efforts just to knitting for charity. If you can crochet then why not investigate suitable items you could crochet for charity too. There are lots of free charity crochet patterns available online. 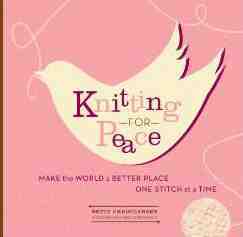 Knitting has enjoyed something of a resurgence in popularity recently. There is a great demand for people to pass on their knitting skills. If you would like to help teach others why not ask at your local school, refuge or young parents club. You will find they bite your knitting needles off with enthusiasm!......... And give you lots of support. Knitting clubs are becoming really popular and once you have shown people how, you can always give them a nudge in the direction of your good causes and get them knitting for charity too! Teaching knitting is a great way to help other people and put something back into the community. So has that whetted your appetite?